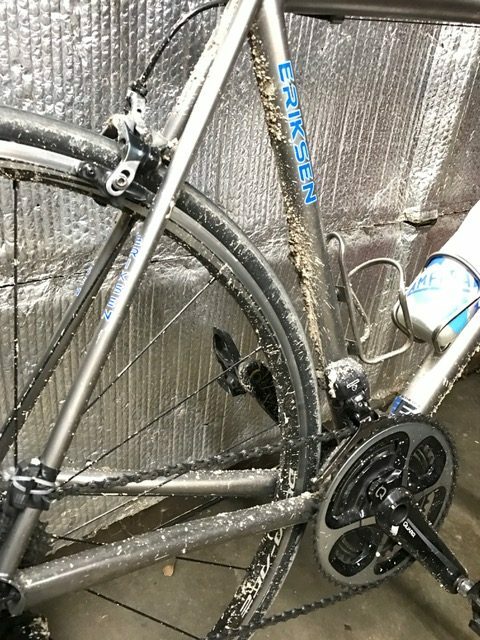 This entry was posted in Comments about Cycling on January 12, 2017 by Steve Tilford. I really haven’t been that out of shape the last few years. I didn’t know that until I rode yesterday, not at altitude and realized that I’m way, way, less fit that I have been for a long time. It’s okay. I kind of expected it. I have ridden maybe 200 miles outside, plus a bunch of times inside, since October 14th. It will have been 3 months since I crashed on January 14th, my brother’s birthday. 3 months seems like an eternity now, but in the whole scheme of things, it really isn’t that long. I might have to multiply those three months by 12 and still be dealing with some of the after effects. Maybe longer if I’m really unlucky. Bill and I rode to Lawrence and back yesterday. We rode pretty directly there and then rode dirt back part of the way. The dirt was really mud mostly, since the River Road is shaded because the sun is so low in the South. Wherever the sun hit, the road was dry and more like smooth pavement than gravel. Anyway, it was nice when we left. In the 60’s, but pretty breezy from the Southwest. So, kind of tailwind there. We stopped and got coffee and then headed back West. Not far after we started back, our luck changed. The wind switched pretty much to the North and it dropped 30 degrees. And kept getting colder. We had left before noon, hoping to ride in the warmth all day. It wasn’t supposed to changed temperatures until after 4 o’clock. But it switched before 2. I wasn’t horrible, just out of shape. Like early season out of shape. I haven’t felt that way in a long time. The hills seemed way steeper and I was pulling on my bars a lot more. I don’t know why, but it seems like I’m not even pulling up with my legs when I am standing. Weird. I think the cold did me a little good. I was riding with bare legs and the cold kept them numb. I think I would have just been sore if that didn’t happen. I’m not only out of shape for riding, but for anything physical. Vincent has some weights in his basement. Sort of a full gym set. He has a bar that has maybe 75 pounds on it. I could barely curl the thing twice. That isn’t right. I understand I haven’t really done anything physical in 3 months, but man does strength leave fast. I noticed the same thing doing pushups a while ago. I tried to do pushups and could barely do 10. Just a couple days later, I did nearly 30, but I was doing 50 a couple months earlier. You’d think your muscles would be strong after rest. Guess too much rest. Normally when I’m not riding I’m doing something physical. Building something, fixing something heavy, hiking, skiing or something that takes stamina. Not this time and it shows. Today we’re driving up to Cable Wisconsin for a few days. I didn’t go there over the holidays and miss the place. Dennis is putting on his ski race, The Seeley Classic, on Saturday and Trudi said she’d help. I don’t know how much help I am going to be, but maybe some. I’m a little worried about the temperatures. My internal thermostat hasn’t been working so great recently, so I’ve been sleeping under a thick layer of quilts. Cable is going to be a lot colder than anything I’ve been in. Guess I need to wear Carhartt lined pants, etc. all day. Bill was gonna go, but I got a text from him at 2:30am saying he is sick and hasn’t slept, so he is staying home. I’m going to take my bike and trainer to ride up in Cable. I’d like to try to ski, but it just depends how the trail is. If it is stable and not icy, then I’ll ski. I fall enough when it is perfect, but have to watch out for that nowadays. So nordic skiing would probably be great for my general conditioning. I’ll just have to check it out I guess. Okay, I didn’t pack anything last night and wasn’t really sleeping, so got up early. I need to wash my bike and get my stuff together to go. I’ve been sleeping a ton recently, like somewhere between 9-10 hours a night, so this was short. Hopefully I can sleep some on the way up. It is 10 hours of driving. The mud was thin, so it just sprayed on my bike, nothing horrible. Tucker loves it up in the Northwoods. 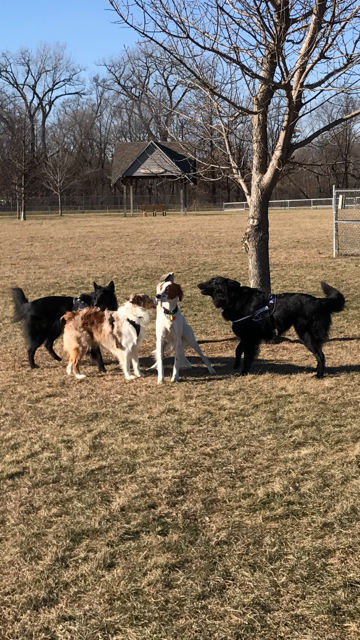 This is him getting surrounded by a bunch of herding dogs in a dog park in Iowa City last week. Uh, I’m really strong in the your body and I don’t think I could curl 75lbs twice! That’s upper body, not your body. Snow conditions for the weekend in Cable and Seeley will be perfect. The Birkie Tour is on Sunday and the temps are forecast to be mid-20s. The Seeley Classic, scheduled for Saturday, should also have great conditions and relatively mild temps. You should rest on your laurels a little bit. Strength does go away fast, but it comes back pretty fast with training. You’ll get there. Patience continues to be your ally. My advice is worth exactly what you are paying for it, but if you still have a classic/diagonal x country ski setup then I would focus on that. OMG…the chainstays on your ericksen road are seriously PHAT!!! I’ll trade you, your out of shape for my out of shape any day. Don’t sweat the conditioning, it will come around fast once you get some consistency in rides and strength workouts. I seriously doubt that was 75lbs. on that bar though, that would be pretty remarkable for most skinny cyclists of any age. Try not to get too frustrated. Severe head injuries are different deal, recovery wise, from musculoskeletal injuries. I don’t think anyone fully understands exactly how it affects the rest of your body, but it does. It’s a slow process comparatively speaking. Put some clothes on. Fred move there. Bob- You might be right. There were two 20 pound weights, two 10 and two 5’s. plus the weight of the bar. Might have been more. I have a picture of it, but can’t seem to manage to get it to post here in the comment section. Winter wonderland in cable. See you soon. 50 miles of fat bike trails perfectly groomed. 30s mid week if you can stay that long. The neuro component of your strength will come back fast with training (your brain just “forgot”); the atrophy component will take a lot longer. I just found your blog about a week ago when I came across a video of the 2013 or 2014 Fat Tire Festival. I was looking for videos to watch while riding a trainer during the cold weather. There in the front row & right in front of the camera was Bill Walton’s twin brother…or his son I wasn’t sure which. After looking up your number & getting your name, I began following your blog. Your escapades, adventures, and the “big crash” (I’m 69 so I’ve also done that) are interesting. Anyway, what was your brother’s/father’s life like on the hardwood of UCLA, & in the NBA? Gary-Glad to “meet” you. I’ve been riding the trainer more too. Maybe not for the same reasons. I’ve met Bill Walton a few times, but am not related. The guy likes bikes. Very large frames. Like giant. That’s as far as our relationship goes, as far as I know. I was just saying that you look enough like Bill Walton to be be his twin. I also cross country ski (a skater) whenever the temp and snow are right.